This document well describes the benefits of a direct-drive recumbent. Is there any carbon-frame recumbent, commercially available, that implements all its recommendations. And what are the pros and cons of having no handlebars like this ? To the best of my knowledge there are no suitable direct-drive hubs available commercially, which means that there are no bikes sold that use them. Schlumpf make a unicycle direct drive hub that offers 1:1 and 1:1.55 gears, but for a recumbent bike those ratios would be ridiculously low. Also, it's obviously fixed gear so without a freewheel it would be even less useful on a bike. Your second question, about having no handlebars, is much easier to do. Most front wheel drive, moving bottom bracket bikes can be ridden hands-off, and it's relatively easy to learn to ride without the handlebars at all. The problem is that most countries require bikes to have handlebars (it's an offence to ride without holding them). One problem I see with the design you link to is that it's partially rear wheel steered. That will affect stability (making the design somewhat harder, but if you're buying one they've already solved that problem). But it will also affect turning. To turn away from something, the rear wheel must move towards it. All rear wheel steer vehicles suffer from this problem. One partial solution is to use a tadpole tricycle configuration, so that the rear wheel is between the front wheels and thus can move sideways as far as one front wheel when turning away from a kerb or other barrier. For a bicycle, the solution is to stop and lift the bike away from the barrier. The problem is that if you run up next to a barrier at speed it may be difficult to stop without hitting the barrier. That's annoying if it's a kerb and you end up sliding along the footpath, but can be dangerous if it's a wall or hedge. 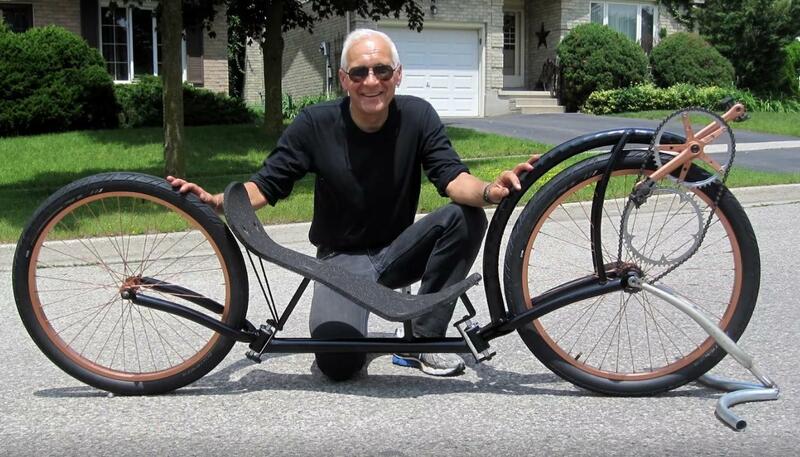 With unusual bikes that someone is selling, I find it's helpful to ask how much someone other than the inventor has ridden one. If they've sold a few and someone has ridden a couple of thousand kilometres on one, then great, it's probably usable. But if it's a great project by one person and you're going to be the first real customer... be very careful. 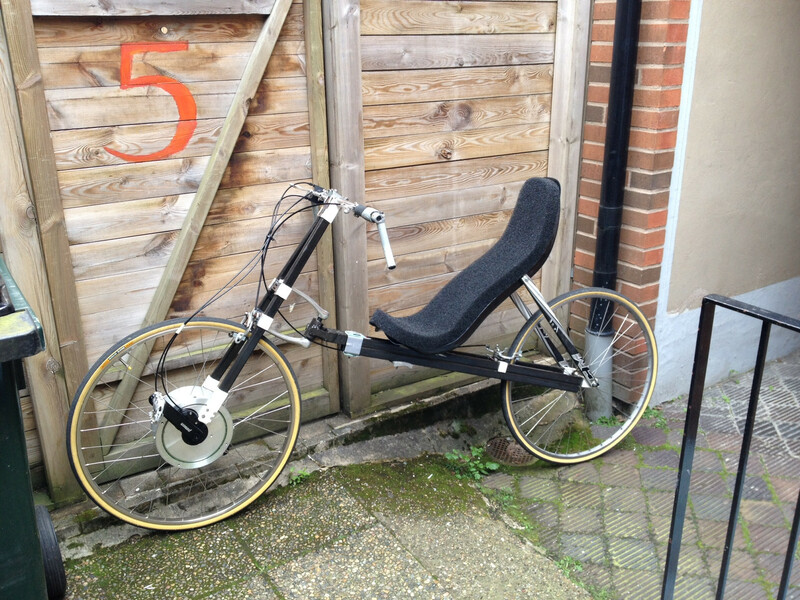 I have built a direct drive (geared) recumbent mostly according to Garnet's specifications. The centerpiece is a Pinion gearbox that conviniently has a lot of gears (needed for a recumbent) and an internal freewheel (Pinion still recommend an "extra" freewheel in the backwheel for normal bikes - probably because the chain otherwise would keep turning when coasting...). The gears 8 to 18 is usable and the speed with nr 18 can easily be over 50 km/h. The riding position is so comfortable I really cant understand why the design hasnt conquered the World. Riding slow in Town is not a problem, no wobbling at high speeds, no numb feet, because of to high crank position. Pinion has seen it but they are busy with the market introduction of their normal bikes. It´s not for sale. Theres a Little film my son put on instagram #hubcycle. Sounds like what you are looking for is a Python recumbent - front-wheel or direct drive hands-free cycling. A Google search of 'python recumbent bike' gives you lots of resources to pour through, although very, very few of those are commercial. Pythons are usually relegated to the DIY hobbyist cycle-riders. But it's a fun venture! I was involved in building a bamboo Python years ago with a French colleague - great fun learning how to ride it. I also have built a direct drive geared bike. But am interested how Joakim managed to modify the Pinion gears to fit them in the hub? Could NuVinci CVT be modified for the purpose? I will await the recumbent version of MC2 bike. I have been in contact with them. 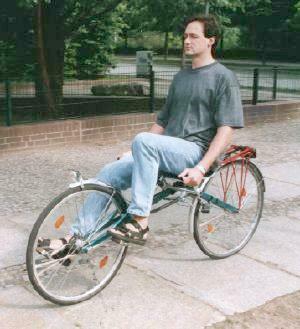 They are launching in Jan '05 and the recumbent form will be available in a subsequent version. Not the answer you're looking for? Browse other questions tagged handlebars carbon recumbent or ask your own question. What are the benefits of a carbon seatpost? Chinese carbon clinchers - cheap but safe? What is the benefit of a carbon fiber fork?